Announcement – my book is now available in print! When I published my ebook last year, a few people asked me whether it would be available as a hard copy as well. I’ve now published it as an a4 paperback on Amazon in the UK, Germany, US, France, Spain, Italy, and Japan. Here are the links for Germany, and the UK. You can find links for the other countries, as well as links to the ebook on other sites, such as Itunes, by visiting the book page. Do you spend hours agonising over presentations that you have to give in English? Do you dread the telephone ringing, because it could mean that you’ll have to speak to an English-speaking colleague or customer? Do you wish that you could speak or write effortlessly, without having to think about every single word and how it sounds? People have all kinds of problems when it comes to learning English. In this book, I share some of the solutions that have worked for me as a language learner or that have helped my customers to develop and use what they know, and reach their potential. 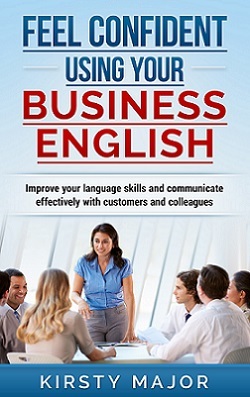 In many ways, my role as an English teacher is to help my customers to find those solutions. I don’t just mean the answers to my grammar questions, but ways to solve the individual problems that they have when it comes to learning English, or putting the English that they have already learned to use in everyday situations. In many cases, people already have much of the knowledge that they need, but other issues, such as a lack of confidence, or not knowing how to get complicated ideas into manageable language, hold them back from achieving their goals. Through my work with individuals from a range of backgrounds, I’ve been able to help people to overcome some of these problems and I’d now like to share my tips and ideas with you. If you’re a teacher, I’ve also written a book in which I talk about my experiences setting up an online language teaching business, what I’ve lerned, what worked for me, and some things to consider when setting up this kind of business on your own. You can find out more about my book for English teachers here.